Four Queen Bedrooms With Private Baths, Lovely Gardens And Amazing River View. 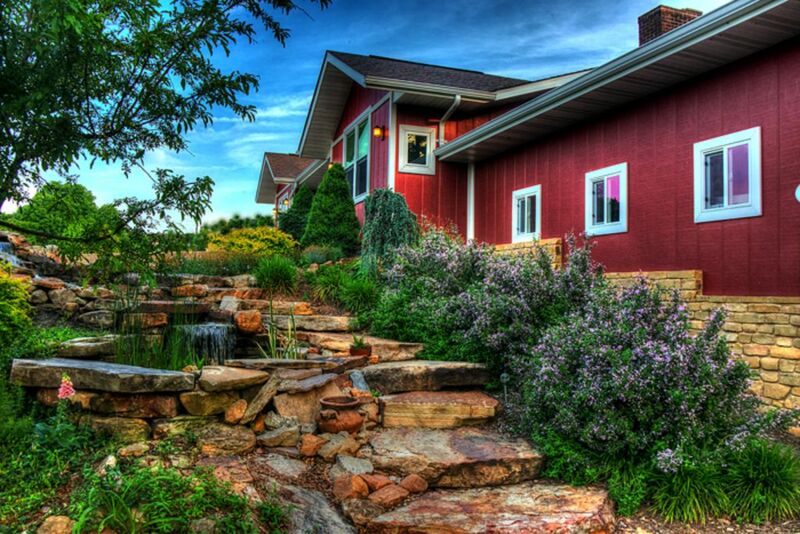 Spirit Hill offers a home away from home for 2 to 8 guests. The contemporary red house is located on a bluff overlooking the Missouri River in Hermann, the most beautiful small town in Missouri. Just five blocks from the Historic District, Spirit Hill is a quiet retreat that's less than a 5-minute drive from anywhere in town - wineries, museums, restaurants, shops, wedding venues, marina, bike trail, Amtrak. Spirit Hill accommodates a group of eight with four queen bedrooms, each with private bath. The home was recently remodeled for a fresh, contemporary feel. If your group is smaller, other options are available. For a group of six, choose the Main Level, available as a complete package with 3 bedrooms and baths. Or choose the lower level Patio Suite for two. Please contact us for rates for these options. There's plenty of parking upstairs and down. And the house is completely accessible, with a roll-in front door and one bedroom with a roll-in shower. Whole House rental includes living/dining area, full kitchen and generous deck with gas grill. Coffee and tea supplies are provided, and biscotti snacks. Breakfast and all meals are up to you. The kitchen is fully stocked with pots, pans, dishes, and even spices. Hosts are on-site in the lower level Innkeepers Suite to answer any needs you may have. Each rental has its own separate entrance. We enjoy meeting you on arrival, but after that, the house is your own unless you need something. We're glad to suggest grocery locations, restaurants, wineries and activities if you like. In operation for more than 12 years, we enjoy sharing Spirit Hill's comfortable spaces and beautiful views with our guests, some of whom have been joining us for many repeat visits. If you're in town for a wedding, Spirit Hill accommodates the wedding party or multi-generations of family for a mini-reunion. Groups of friends, couples or singles, enjoy relaxing on the deck or around the dining table for meals, games and laughter. We happened on Spirit Hill one day when we were staying in a Bed & Breakfast in Hermann. The stunning river view stopped us in our tracks! And there was a 'For Sale' sign in the yard ... so three weeks later, Spirit Hill was ours! After six years of enjoying weekends in the charming historic town of Hermann, we were able to move in full time. We did a complete rehab and expansion based on meeting the needs of our guests. It resulted in a completely new look, four bedrooms with ensuite baths, a separate Innkeepers Suite, and a beautiful, rocky landscape with two small fish ponds and a waterfall. We love to share the beauty and benefits of the property and the town! Only a few homes in Hermann enjoy such a beautiful river view. Year round, it's satisfying to watch the river flow and to see the water rise and fall with the seasons. Views from inside and outside the house make Spirit Hill a truly special place. Spirit Hill was remodeled to resemble a Swedish summer house, with red walls and white trim, as a nod to our family's Swedish roots. The light is an important feature of the house, with windows spreading light from front to back. Even after dark, Spirit Hill is a fine location to watch for shooting stars, away from city light pollution. toilet, shower, jetted tub, Accessible, with handheld shower and shower seat. toilet, shower, Charming small bath with triangular vanity and vessel sink. toilet, shower, Copper sink, antique vanity, heated floor tiles. toilet, shower, jetted tub, Oversized whirlpool and a separate tiled shower. All bathrooms have fresh white towels, soap, shampoo, a hairdryer and a makeup mirror. Basic spices, olive oil and balsamic vinegar are available. Just ask if there's something else you need! Seating for 8 indoors, and seating for 8 on the outdoor covered deck. Plentiful flowers vary with the season. Two small ponds are home to happy fish, and one waterfall leads up stone steps to the front door. Private river-view balcony off the Starlight Room. Seating for 8 around the main table on the covered deck. Additional seating and table on the lower level patio. The front drive curves right up to the barrier-free front door. Roll right inside and find the Village View room accessible, complete with accessible vanity and roll-in shower with sturdy seat. Housekeeping is provided before and after your stay. During your stay, maintenance of the home is up to you. If there is anything special you need, please let us know. Our innkeeper/gardener is often outside and enjoys sharing plant knowledge, seeds and seedlings with interested visitors. Small scale events are a possibility. Personal kayak tours and/or knitting lessons may be arranged directly with the innkeepers. Please discuss your wishes with us. Great house, owner is very outgoing. Would stay again! This was our group of friends second stay at Spirit Hill. Everything was great as usual. We all especially like the fire pit overlooking the river. The rain stayed away enough to enjoy the fire both nights. The house is nicely decorated and clean. The hosts are scarcely around but when we encounter them they are both very nice. We will definitely stay there again. We celebrated my dads 75th birthday out in beautiful Hermann with three generations, all who thoroughly enjoyed this perfect vacation home that was clean, well appointed, and charming. We’d do it again in a heartbeat. We were in Hermann the weekend before Thanksgiving for a wedding and booked our stay at Spirit Hill. This house is amazing! Beyond our expectations! Simply wonderful and beautiful in every single way - we hated to leave! Wonderful weekend at perfectly beautiful home!! We could not have been more pleased with our stay at this lovely home!! Very clean, well appointed and spectacular view! Loved the fire pit overlooking the river. Room/suites are private, spacious and beautiful. Our group of 8 had a great time and can't wait to return in future. Owners very responsive and attentive. Thank you for everything! Love our stay at Spirit Hill!!!! Whole house rental is designed to sleep 8 guests graciously. There is a queen-sized sofa bed in the Patio Suite to accommodate two more, at an additional fee of $25 per night per extra guest. We are sorry, but we cannot accept reservations for more than 10 guests.